With open hearts and minds, we welcome people for Christ, grow people in Christ, and serve people with Christ. One of the things I most value about FUMCR is that we are a "Big Tent." That is to say that we have people who have found a spiritual home here who come from differing backgrounds, hold differing political views, and can be found along a wide spectrum of theological beliefs and social issues. While not being of one mind on every issue, our hearts burn as one to follow Christ, to do his will, and to be his people. We disagree at times about how best to do that, but we find common ground in our commitment to "do justice, love kindness, and walk humbly with God" (Micah 6:8). Take time to browse through our various ministries, and you will discover imperfect people striving to know more about God and to make a difference in our community and world. We would love for you to visit a worship service and see first hand what we are all about. We may appear like a big church on the outside, but we really have a friendly, small-church feel through our large array of ministries for all ages and stages of life. Come and see what God is doing at FUMCR! We realize that visiting a new church may be a time filled with excitement and sometimes a little anxiety. We want to make your visit as comfortable as possible, so look over the website for information about our various ministry areas. Feel free to contact us, too. The Welcoming Ministries team is listed below. We look forward to seeing you soon! What should I expect when I visit FUMCR? The first thing you should expect at FUMCR is a warm, friendly atmosphere with smiling faces to greet you. Our mission is with open hearts and minds, we welcome people for Christ, grow people in Christ, and serve people with Christ. We strive to embody that vision every day, as all people are welcome at FUMCR. What should I wear to attend a worship service at FUMCR? On any given Sunday, you may find a man in a suit & tie sitting beside a family who is in jeans. You may see a young child in her “Sunday best” walking beside a woman in hospital scrubs who just got off her shift. There is no specific dress code for any of our worship services, and you are welcome to come as you are. How can I stay up-to-date on upcoming events? You can view our event listings at FUMCR.COM/EVENTS, download our FUMCR App (available from the APP STORE and GOOGLE PLAY), and SUBSCRIBE to our e-newsletters (weekly Staying Connected, Dr. Oliphint's On the Way and interest-specific lists). What types of worship do you offer? • ASIAN MINISTRY meets as a Sunday School group once a month at 9:45 am in Room 212. Conducted in Urdu. What is the difference between FUMCR’s traditional and modern worship services? Traditional worship services include prayer, scripture and thought-provoking sermons from Dr. Clayton Oliphint or one of our associate pastors. Music is always an important element of worship. Youth and adult choirs sing anthems, including occasional gospel, classical and more contemporary pieces. 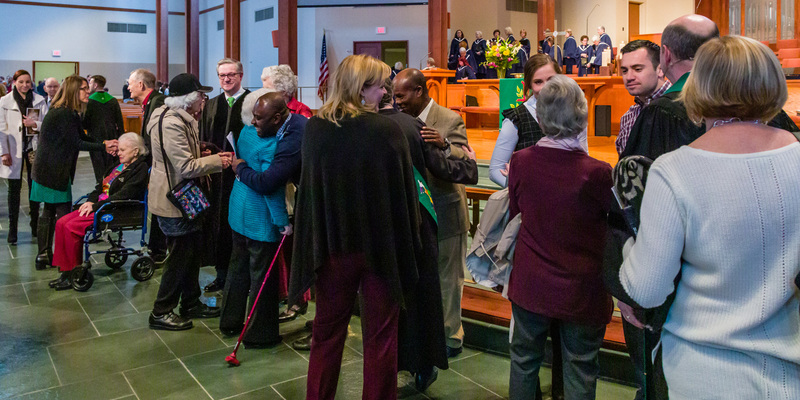 Congregational singing is from the United Methodist Hymnal and The Faith We Sing. Communion is offered on the first Sunday of each month. Modern worship service includes prayer, scripture, and thought-provoking sermons similar to traditional worship, but you can expect the unexpected. For example, you might find yourself assembling gift bags for homeless individuals in worship or texting questions for a live Q&A after the sermon. The band leads the primarily contemporary music, with the occasional older hymn sung in a new way. Modern worship fully embraces the come-as-you-are, casual atmosphere of our FUMCR community. I’m interested in learning more about where I am on my own faith journey and how to move forward. What should I do? We are excited to share this time with you, as you learn more about deepening your faith! MY JOURNEY, an online tool created by staff at FUMCR, is one way you can discover where you are on your faith journey and what steps may be available for you to expand various relationships, e.g. with God, with your community, with the Bible, etc. We invite you to read more about MY JOURNEY on our website and use the tool at MYJOURNEY.VOYAGE to gain more insights into your own faith journey! Your answers are completely anonymous to the church, and the tool is provided for your personal use only. I'd like to get involved with a small group. What options do you offer? We offer a wide variety of small groups! Visit the GROUP FINDER to see short- and long-term for study, service, fellowship, and sports, and for different (or mixed) ages and genders. What is the difference between a Sunday school group and a Group Life group? SUNDAY SCHOOL GROUPS are a variety of open, on-going groups, each committed to spiritual growth, mission and fellowship that meet on Sunday mornings at the church. Guests are encouraged to visit a few different groups and experience the unique personality, teaching style, topics and size that each one offers before choosing one. GROUP LIFE sessions are held each fall and spring, meeting weekly in groups of 10-16 people for 10-12 weeks. The provided curriculum may be either sermon-based or topic-based. These sessions do not take place on Sunday mornings. They may meet on campus, in the community, or in group members’ homes. Groups take a break from study between sessions, but often plan social or service activities, if the group plans to continue the next semester. What options do you have for my children? From newborns through high school seniors on their way to graduating, we have several options for your children. Children, regardless of age, are always welcome in worship. John Westerhoff, a leading Christian educator, believes that faith is “caught” not taught and what better way for children to know what faith is all about than to participate in a community that welcomes them! In traditional worship, we have a special Children’s Time during the service led by our Children’s Ministry. We also have colorful children’s bags located at each entrance to traditional worship, where you can find crayons, stickers, a story book and coloring paper to keep young minds and hands busy. A professionally staffed nursery is available for infants to 2-year-old toddlers from 8:30 am - 12 noon each Sunday. Pagers are available upon request. Sunday School is provided for children from age 3 through 6th grade. During the 6th grade school year, our confirmation program runs from September until May. To learn more about our children’s ministry, please visit FUMCR.COM/CHILDREN. Our dynamic Youth Ministry is available for 7th – 12th graders. They meet for Sunday School at 9:45 am in the Youth Worship Space located on the 2nd floor of Bartula Family Life Center. Our teenagers will also find United Methodist Youth Fellowship every Sunday night (7th & 8th grades meet from 5-6:45 pm and 9th-12th grades meet from 6:30-8:30 pm). To learn more about our youth ministry and other options available, visit WWW.GETWEIRD.ORG / FUMCR.COM/STUDENTS. What types of volunteering or serving opportunities are available at FUMCR? Not sure where you would like to volunteer or how you would like to serve? Let us know what your talents and passions are by completing our VOLUNTEER INTEREST FORM, and we will contact you with opportunities that might be a great fit or ministries that could use your support!